Zoho Sites is part of Zoho’s well-known productivity suite. It is a simplified and free website builder that allows businesses and individuals to make professional and detailed websites in literally a few minutes, without coding knowledge and IT expertise. 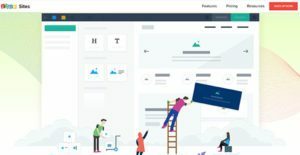 The platform works with an easy-to-handle drag-and-drop builder, and uses intuitive navigation patterns and familiar features to engage the audience. The creator is mobile-empowered, and can be used either as a standalone product, or an integrated addition to Zoho’s business productivity kit. The basic functions and capabilities of Zoho Sites are for free, but you can also purchase professional add-ons for extended personalization on an affordable price. The biggest advantage of Zoho Sites compared to similar product is that its development team gave their maximum to simplify user experience. The website owner saves an incredible amount of time by simply editing pages with the drag-and-drop functionality, while the end user benefits from a friendly interface and a highly familiar navigation pattern even from his mobile screen. At the same time, Zoho Sites is one of the rare website creators that won’t break the bank, first and foremost because it is free to create and update, but also because it doesn’t require complex installations and hiring coding professionals. The platform suits all types of users, but it is mostly recommended to small and mid-sized retail businesses which want to display product suits online. The beautiful slideshows and multimedia support make it possible for retailers to entice visitors with visual podcasts, demos, and modern libraries. Online sales are enabled with an assortment of e-commerce tools, and interaction goes both ways allowing customers to comment and review products. Social networks integration has also been taken into account. Finally, Zoho Sites is SEO optimized and secure, and offers a variety of page controls to help you manage content properly. The hosting is reliable and unlimited, and there is a variety of powerful integrations to help the platform blend seamlessly into your software infrastructure. If you are interested in Zoho Sites it might also be a good idea to examine other subcategories of Best Blog Software listed in our database of SaaS software reviews. Each enterprise is different, and might call for a particular type of Blog Software solution that will be designed for their business size, type of customers and staff and even individual industry they deal with. We advise you don't count on finding an ideal app that will work for each business no matter what their background is. It may be a good idea to read a few Zoho Sites reviews first and even then you should remember what the service is intended to do for your business and your employees. Do you need a simple and straightforward service with only essential features? Will you really use the advanced tools required by pros and large enterprises? Are there any specific features that are especially useful for the industry you operate in? If you ask yourself these questions it is going to be much easier to locate a reliable software that will match your budget. How Much Does Zoho Sites Cost? We realize that when you make a decision to buy Website Builder Software it’s important not only to see how experts evaluate it in their reviews, but also to find out if the real people and companies that buy it are actually satisfied with the product. That’s why we’ve created our behavior-based Customer Satisfaction Algorithm™ that gathers customer reviews, comments and Zoho Sites reviews across a wide range of social media sites. The data is then presented in an easy to digest form showing how many people had positive and negative experience with Zoho Sites. With that information at hand you should be equipped to make an informed buying decision that you won’t regret. It's so easy to make a site with Zoho Sites! A clunky platform, but worth pursuing because of its low price. Lots of functional tools for just about every group there is. What are Zoho Sites pricing details? What integrations are available for Zoho Sites? Pros: I use Zoho Sites’ free version and I like that it allows me to share spreadsheets and documents with others. To ne honest, I like every product that is alternative to Google because it has lots of control and power of majority of search traffic online. I really support this kind of products because its main goal is to help their customer. Cons: It can be really difficult to invite collaborators. I’d like to see simple option to share files and spreadsheets with others. Ideally, we could add people within the box and provide them with access of our page. Also, it would be great if they could allow us to crowssource information. Pros: Zoho Sites lets me come up with my own website. It offers plenty of opportunities to create a worthy and attractive site. You have pre-installed templates at your disposal. Editing or adding pages to the site is a cinch. You can even check the site's analytics. One of the most important thing with this platform is its super low price. Cons: For newbies, the UI can be a bit overwhelming and confusing. So navigating your way around the platform could take a bit of time. Their support won't always give you the answers you need to solve issues that come up when using their services. It would be be nice to have additional tools to further expand and improve the site. Integrate your creations without restrictions. If you need more information about Zoho Sites or you simply have a question let us know what you need and we’ll forward your request directly to the vendor.